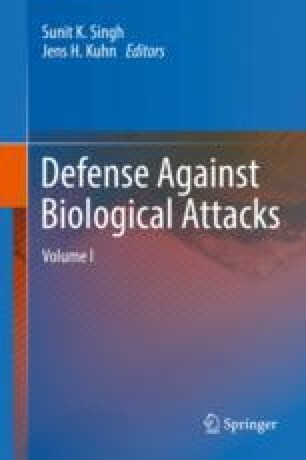 This chapter presents the most recent scholarship on the most important periods in the history of biological warfare. Historically, state-based biological warfare programs have been viewed as posing the only biological threat to international security. More recently, non-state actors such as terrorists and criminals have also demonstrated an interest in acquiring and using biological agents as weapons. This chapter provides an overview of the long and complicated history of the development and use of biological weapons with an emphasis on the key state-based programs and terrorist groups that have invested the most effort in acquiring and using biological weapons. Lentzos F. Syria and bioweapons: the need for transparency. Bull At Sci. 2013. http://thebulletin.org/syria-and-bioweapons-need-transparency. Accessed 22 Sept 2017. Ben Ouagrham-Gormley S. Bioweapons alarmism in Syria. Bull At Sci. 2013. http://thebulletin.org/bioweapons-alarmism-syria. Accessed 22 Sept 2017. Deutsch A. Exclusive: Syria reveals more chemical weapons facilities to watchdog – sources. Reuters. 2014. http://www.reuters.com/article/2014/09/17/us-syria-crisis-chemicalweapons-exclusiv-idUSKBN0HC1GA20140917?utm_source=twitter. Accessed 22 Sept 2017. Lynch C. The world may never know if Syria really destroyed all its chemical weapons. Foreign Policy. 2016. http://foreignpolicy.com/2016/08/31/the-world-may-never-know-if-syria-really-destroyed-all-its-chemical-weapons/. Accessed 22 Sept 2017. Ministry of National Defense. 2012 Defense White Paper. Ministry of National Defense, Seoul. 2012. http://www.mnd.go.kr/user/mnd_eng/upload/pblictn/PBLICTNEBOOK_201308130553561260.pdf. Accessed 22 Sept 2017. Hanham M. Kim Jong un tours pesticide facility capable of producing biological weapons. 38 North. (2015). http://www.38north.org/2015/07/mhanham070915/. Accessed 22 Sept 2017. Ben Ouagrham-Gormley S. Potemkin or real? North Korea’s Biological Weapons Program. Bull At Sci. 2017. http://thebulletin.org/potemkin-or-real-north-korea%E2%80%99s-biological-weapons-program10957. Accessed 22 Sept 2017. Doornbos H, Moosa J. Found: the Islamic State’s terror laptop of doom. Foreign Policy. 2014. http://foreignpolicy.com/2014/08/28/found-the-islamic-states-terror-laptop-of-doom/. Accessed 22 Sept 2017. Doornbos H, Moosa J. Recipes from the Islamic State’s laptop of doom. Foreign Policy. 2014a. http://foreignpolicy.com/2014/09/09/recipes-from-the-islamic-states-laptop-of-doom/. Accessed 22 Sept 2017.